There have been several occasions where someone has tried out one of my techniques and created an image that is obviously attempting to emulate one of my pictures, but for the most part they give me a shout out. (To those of you that have, I'm so pleased that I've inspired you to create and I really appreciate the link back to my work! You are the reason I take the time to make these blog posts and share how I do things in the first place.) I want more art in the world. I want more cool people, to know how to do more cool things, and make even MORE COOL ART! It's totally fine to practice by attempting someone else's method of creating an image, as long as it is just that: practice. If you take a stab at making an image that has basically already been made in order to learn and grow as an artist, that's great. The problem is when someone copies another artist and then just says, "look at this amazing image I created," and slaps it up on the landing page of their website as if they just came up with it all on their own, as if it isn't a blatant re-creation of something they saw and loved. If you see something, love it, and want to create it, fine - but you'd better be damn clear as to whom inspired this creation and shower them with links and love and gushing compliments!! OR, take the idea so far from that original that it becomes your own (...and then still give them credit). This is what I'm here to tell you about today: how to respectfully BORROW someone else's idea and twist it into your own creation. Even if you take it a million zillion miles away from the original idea, so far that no one is ever going to know who you've tapped into for a little inspiration, it's still always courteous to let the world know who inspires you and just say "Hey, go check out this image that inspired me to MAKE THIS COOL PIECE OF ART!!" Now here is where this "borrowing" thing gets a bit murky and harder to deal with. This has happened to me for sure and I'm willing to bet you've all done it too. I'll see an image somewhere and it sneakily leaves an imprint somewhere in the back of my brain. Later on down the road I'll have this brilliant idea "pop into my head" of an image that I want to create. In reality it didn't pop into my head just then, it crawled into my noggin weeks ago when I saw it and then later snuck up to the front of my brain parading around as an original thought. This is just going to happen. Fortunately if this does happen to you, the image you end up creating from this "original idea" is usually going to organically evolve into your own creation and will go unnoticed as a secretly inspired image. No harm, no foul. Tons of people make LOTS of similar images all the time. Some of them are in fact genuinely both original ideas from different people; it's not impossible for two people to have the same thought and make similarly awesome pictures. However, if later down the road you see the image again that unbeknownst to you inspired your creation in the first place, you might be inclined to think, "oh crap I totally didn't actually come up with that, did I?" Well then I feel it is your duty as a creator-of-art to go right ahead and tell the world! SOooo yeah, this totally happened to me and I'd like to officially come clean right here, right now. You see a long while ago it seems I came across an image....I'm not even sure where or when, but I guess it got stuck in my head. Then later...I sorta borrowed a lot from it while creating my image "The Elemental Line." I definitely did take the idea in a different direction and there are LOTS of "Robert Cornelius flares" added to it, but upon looking at them side by side, the inspiration is pretty obvious. 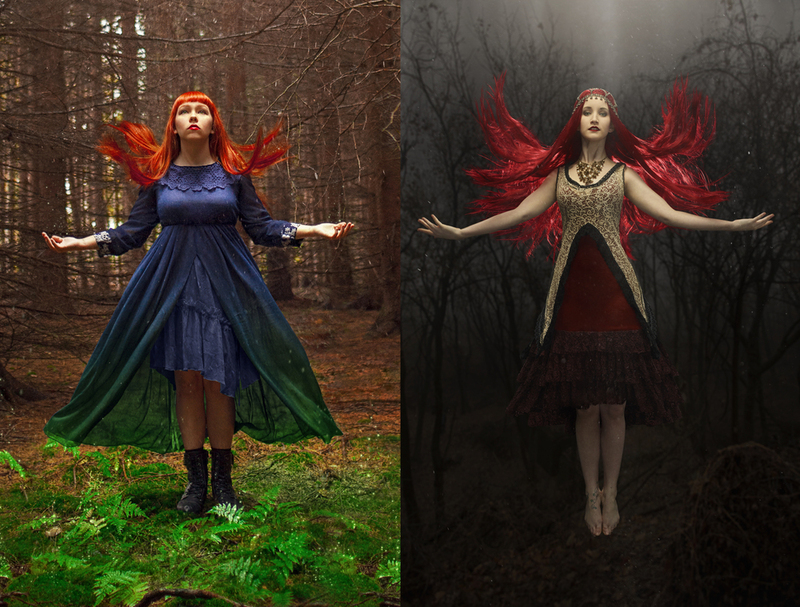 The image on the left is by the incredibly talented Anja Stiegler of "Photo Flake." I'd like to thank Anja for being a wonderful artist and inspiring me to create a half-underwater image of my very own!! I saw her image called "Drowning Softly" (flawless title in my opinion) while already plotting this blog post in my head and was like, "HOLY CRAP I REMEMBER SEEING THIS NOW, I'M A THIEF .... HOW PERFECT!" I fell victim to the very thing I was going to be talking about. Clearly it really can happen to anyone. Doing just ONE of these things is not going to be enough, so try combining as many of these different tips together as you can to really change things up and make it more your own. If possible try switching the gender of your model in the image you're pulling inspiration from to immediately differentiate from the original. Fish. Just add a fish....haha but seriously, think about adding some different props or even small characters to the scene to give it a little extra something. In the original image by Anja, her character has some snazzy spectacles on. If I had created my image (even with mine being of a girl not a guy) with glasses on as well, it really would have been a bit more obvious that I'd borrowed her idea. So if there is an obvious detail of the image you can leave out, do it. You can always do a drastic color swing. If the image you are being inspired by has lots of warm tones, consider making your version with lots of cool tones instead. My color palette is a bit similar to the original (I'd just like to remind you that I was creating my "copy" unaware that there was secretly another image forcing my hand), but I did go with a more vibrant saturated feel. Try using a different crop. If the picture you're drawing inspiration from has a horizontal orientation, maybe consider making your version a vertical image instead. Also, if the original is a left heavy picture, maybe flip it around and have your subject on the other side of the frame. Get naked.... Or maybe have your model get naked? If you are naked and they are clothed that might be a slightly uncomfortable photoshoot, but to each their own. I didn't actually have my model Molly get naked, but I wanted it to appear as though she were. I had her move the straps of her shirt off of her shoulders and then cropped the shirt out. The more you can switch up the wardrobe from the borrowed image the better. 10. GIVE SOME GODDAMN CREDIT! This is by far the most important tip when borrowing an idea. GIVE THE ARTIST CREDIT FOR THEIR BRILLIANT IDEA!! People love to know that they've done a good job, that they have set a creative fire in another human and sparked a work of art that might never have existed. I know for me it warms my insides to know that a piece of my art has touched someone in such a way that they want to be a part of it. So whenever you borrow even the slightest sliver of inspiration from someone, even if your image ends up having NOTHING to do with theirs; just let them know that they are the reason you took time out of your day to put some more art into the world.